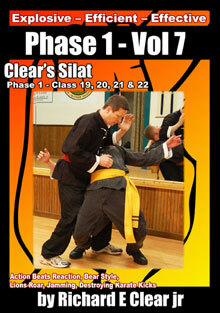 In Clear’s Silat Jamming is used as a technique to control the other person’s entire body through one point of contact. For instance if the attacker has their fists up in an aggressive stance then the defender can jam the arm at the elbow to control the attackers body through the elbow. move the attacker’s elbow into their body downward and at an angle and in a position so that when they try to throw a punch their own elbow pushing into their body stops them from being able to throw the other punch. 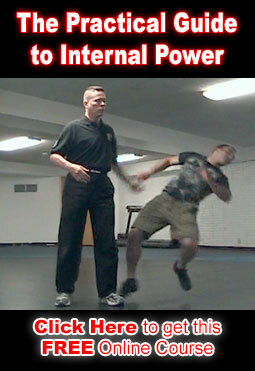 This technique could be performed by intercepting an incoming punch and then moving the arm across the attacker’s body so that the elbow can be controlled and used the same way to stop the other punch from ever being thrown. by controlling the closest arm and pushing the attacker’s head back and to the side of the opposite arm while walking into them and past their current position. Other areas of the body that can be used to control the attackers body are the shoulder as used in zero pressure and the hip in much the same way. You can control the opponent’s body movement by stomping and standing on the back of their knee. You push forward and roll the muscle and / or tendon so that the edge of your foot or shoe causes their nerve to be pushed against the bone just below the knee. Done properly with a bit of pressure the opponent will be very weak or / and unable to move and you will be standing with their leg pinned to the floor. You can also step on the foot where it meets the ankle or leg and put pressure so that they are unable to correctly stand and they will feel weak as a kitten. You can stand on the foot at the outside position or from the inside position depending on what is easiest depending on the physical positon of them relative to you at the time of execution. In Clear’s Silat Jamming techniques will build your ability to control the other person’s body in case you do not want to do them serious harm or if you need to move them in certain ways to control their ability to access and engage a weapon and also to control them in such a way that it makes it easy to use them as a weapon against a second or third assailant. Defending against multiple attackers is a basic self defense component of Silat and Clear’s Silat and jamming is an essential skill to master to help gain the understanding and ability to effectively defend yourself in a wide variety of circumstances against multiple attackers.